Vienna. The very name evokes musical images. Mozart. Strauss. Beethoven. The list goes on. But, the only music that I could hear from way up here was an insistent drumbeat. Problem was - the drums weren't being beaten by sticks or even, like bongos, by hands. The drumbeats were the insistent whacks of my heart. 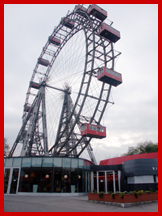 The Riesenrad may just be Vienna's "signature" attraction for kids. And why not? It's one huge Ferris wheel set in the Prater park's Volksprater amusement park. What kid's imagination wouldn't be captured by it? Now, the Riesenrad doesn't move real fast. It's very slow as a matter of fact. It doesn't twist or whirl or drop enormous vertical feet in seconds. No. It hangs in the air. You climb into these cages with windows all around and a bench in the middle, and you ascend v-e-r-y s-l-o-w-y to almost 195 feet and descend again equally slowly. Which is enough to give someone like me - someone with a bad tendency towards vertigo - plenty of time to freak out. Kids don't freak out at the top of slow-moving Ferris wheels. They stare at the skyline. They ogle the teensy people on the ground below. They espy other rides in the park that they'll just have to test. Kids are much better suited to this kind of thing than I. Bless 'em. In summer, the Prater is a combination of Six Flags and Central Park. The place covers 6 million square meters (don’t ask me what that is in miles - something like 3.5) and in it you can do everything from play ball, golf and watch horse races to taking part in a themed tour, riding go-karts, seeing a dinner show or visiting the Prater Museum to learn the park’s history. The Riesenrad is entered through a mini-museum in which a series of Riesenrad cars have been filled with dioramas that depict the city’s (and Prater’s) history. Scenes like the medieval construction of the cathedral and a battle against the Turks are shown. Some have moving miniature people and horses in them. We came to Vienna to hear famous classical music played by famous orchestras and performers. Now, while most kids may not want to spend hours listening to Mozart or Beethoven, they'll find plenty in Vienna they do want to do. Indeed, it's a pretty kid-friendly place. Even if you venture there in November, like we did. Start with the pervasive streetcar system. Seems like you can get almost anywhere in town by troller or, as they call them, tram. Face it. Kids love to ride in vehicles like trams. Especially when they come in different colors and styles. There are new-school and old-school designs. There are red ones, blue ones and silver, too. And, should they tire of riding trolleys, there's this very cool and efficient subway system to ride. 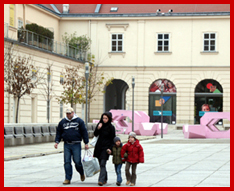 We reached a lot of kid-enticing spots - like the Prater - by tram or train. We boarded, for example, the U4 west (that’s the "underground" heading west) to the Hapsburgs’ Schönbrunn Palace. Schönbrunn means "beautiful spring"; this expansive building was completed by Maria Teresa in the mid 18th century as a summer palace. It’s surrounded by extensive gardens, a maze, puppet theatre and even a zoo. There is a wonderful view of Vienna from the upper end of the gardens, and a place to snack in the garden-top building called the Tiergarten. 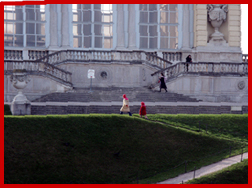 We embarked on the extensive palace tour-with-audio-guide that narrates one’s travels through the Baroque rooms. Children's Tours, available on weekends and public holiday afternoons, teach kids about life in the Schönbrunn Palace and its 1,440 rooms. Until age six, each imperial child had three rooms of his or her own: an anteroom, a salon and a bedroom. After that, they were given two more rooms: another anteroom and an audience chamber. Makes you wonder how often the Imperial Mom had to yell at them to clean their rooms. Not often, one imagines, since some 1,000 servants worked here. If your children aren’t yet classical music fans, the Marionette-Theater at Schönbrunn Palace will still enchant them. The marionettes are true works of art, and watching them perform operas like The Magic Flute may be just the way to stimulate a classical interest. If not, they’ll love productions like Aladdin and A Little Night Music. Zoom children’s museum was another destination we reached via trolley. Set in the Museum Quartier - a collection of modern and classic art museums - Zoom is all about getting your hands on things. We discovered a roomful of kids playing archeologists, digging in real sand and recording their discoveries on prepared sheets. Down the hall, younger kids were listening to stories. In another room, really young tykes were creating sculptures from clay and odd objects. And, elsewhere, older kids were making a television show. Clearly there was a lot of imagination in operation here, and a printed schedule indicated that the experiential classes go on non-stop. We’d come to Zoom from the Hofburg Palace, where we’d gone to see not how the royal people lived, but the royal horses. The famous dancing, prancing Lipizzaner horses are known worldwide, and this is a must-see for all equine fans. Or, even for those - like me - who aren’t so fond of horses. The Lipizzaner A-team performs here only during the winter months. They were touring in Germany while we were there. But, a full house audience was on hand to watch the horses-in-training run through a training session to rip-roaring recordings of Wagner and the like. Very impressive are these horses. Why not? They lead a totally spoiled life, with months off in the summer to roam the open fields, and the life of Riley after retirement. I could take an interest in their job. Not so being one of the riders. Only a select few boys can make the team, and the rigorous schedule and training is onerous enough to make the salt mines look attractive. All this we learned on the apres-workout, behind-the-scenes tour, in which we got to visit the stables and meet the horses up-close and personal. A horse lover’s dream. We didn’t reach every destination by rail. We strolled on the pedestrian Kartnerstrasse, heading to Stephansdom, the gothic cathedral known as "the symbol of Vienna." Kartnerstrasse was loaded with shops, but the kids on the street - especially younger ones - were getting a big kick out of the buskers and street performers in Stephansdom Plaza. 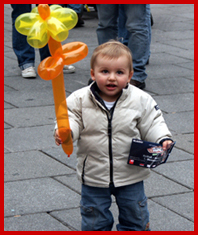 Clowns were creating balloon figures that had the kids fascinated. Returning along the Kartnerstrasse, we rode the glass elevator at the Steffl department store. It wasn’t the world’s highest ride or anything, but it revealed a fine view of the street. And, hey, who doesn’t love riding in a glass elevator? The Sound Gallery in which you experience different kinds sounds, including a "prenatal" experience. The Great Masters of Viennese Music Tradition floor in which the lives of renowned composers like Haydn, Mozart and Beethoven are revealed. And, a strong kid favorite, The Virtual Conductor, where visitors conduct a video version of the Vienna Philharmonic in which the orchestra actually follows your lead. There’s more - like the Futuresphere, and interactive Brain Opera exhibit with unique new ways to create music, and the Mind Forest’s hyperinstruments that blend visitors’ movement, touch and voice into novel sounds. In the end, Haus der Musik provides a fine excuse to make and listen to noises. 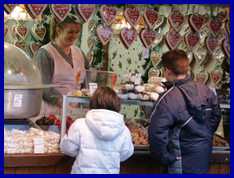 Since Christmas was approaching, we returned underground to reach the Christmas market at the Rathaus. That’s city hall. In fact, we encountered small Christmas markets all over town. Almost any church yard, square or other open space seems to provide an excuse to create one, but this was the largest. Colorful it certainly was, although most of the items are trinkets produced in the Far East. Several kid-friendly exhibits did spice up the place, including a house in which to meet fairy tale characters, a merry-go-round with a Christmas scene rotating on it, and a small house displaying fancy dolls. Much more could be seen and done. But, our time was up. Among the other possible stops?